I love fresh mild white fish in a rich creamy sauce and there's nothing like adding a few capers to brighten it all up. 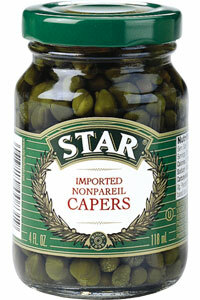 Capers add add a wonderful flavor to any chicken or fish dish. I use Star Fine Foods Capers when I want to brighten a lot of my sauces because they are the perfect little ingredient to liven up your dish. Add them to your chicken or fish and to any sauce for a nice touch to any savory sauce. Melt the butter and the olive oil in a skillet over medium high heat. Salt and pepper filet and add to skillet searing for about 3-4 minutes on both sides until lightly brown. Remove from pan and set aside. In the same skillet, add flour to the melted oil and butter and whisk to remove lumps. Add wine or chicken stock and stir until slightly thickened. Add in heavy cream and continue to stir over medium heat until sauce thickens. If you want to thin the sauce add more cream as needed. Reduce the heat to low. and salt and pepper to taste. Pour sauce over fish and serve. This is a keeper my friends! You can buy the capers at Costco, Stater Brothers Markets, Smart & Final, Bashas, Albertsons (So. Cal) and online at http://bit.ly/STARcapers.